As American authorities search for answers into mysterious "health attacks" that began two years ago in Havana, U.S. and Cuban officials met Thursday to renew efforts to determine the method and motive behind incidents that have left some diplomats with brain injuries. The talks at the State Department came as national security agencies and members of Congress express frustration about the lack of answers about what the U.S says were deliberate attacks on some two dozen staffers at the U.S. Embassy in the Cuban capital. Recent reports have suggested investigators have narrowed their suspicions about to cause and culprit, although State Department spokeswoman Heather Nauert denied that any conclusions had been drawn about either. "We still don't know the cause, we still don't know what or who is responsible for health attacks that took place that affected our personnel in Cuba," she told reporters. Cuba's Foreign Ministry said nine members of the scientific team it assembled to look into the incidents met with U.S. lawmakers and the National Academy of Sciences before the talks. 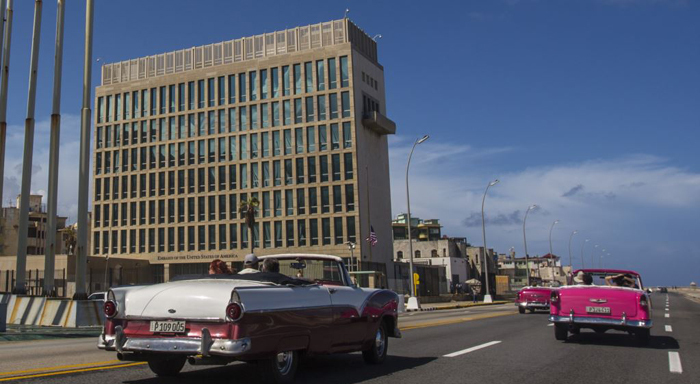 The Cuban Embassy said the team was proposing "a dispassionate examination of health reports of U.S. diplomats in Cuba according to the rules of science." Nauert did not address the Cuban comments and said the meeting "involves private medical information that is coming forth from some of our people." She and other officials have previously played down or denied reports that investigators have focused on a microwave device as the source of the attacks and that Russia is the leading suspect. Those reports have raised protests from Cuba, which does not dispute the symptoms but insists there is no evidence to support any assertion that they were caused by premeditated attacks on its soil. Cuba has repeatedly denounced the U.S. accusations as politically motivated and unproven. Twenty-five U.S. Embassy workers in Cuba, as well as one at the U.S. consulate in Guangzhou, China, have been affected by mysterious health incidents that began in the fall of 2016. The range of symptoms and diagnoses includes mild traumatic brain injury, also known as concussion. The last case from Havana was confirmed in June. The U.S. said two embassy staffers were affected in a single occurrence in late May in a diplomatic residence at which both officers were present. Those were the first confirmed cases in Havana since August 2017. One U.S. official said Thursday's meeting was organized after Cuba complained that Washington has withheld important details about the affected Americans' medical conditions. The official was not authorized to discuss the matter publicly and spoke on condition of anonymity. In congressional testimony last week, State Department medical personnel suggested they had shared more information with China about the incident in Guangzhou than they had with the Cubans about what has happened in Havana. In two classified briefings with congressional aides and lawmakers last week, the officials repeated that they had not come to any conclusions about what caused the injuries or who might be responsible for them, according to officials familiar with the meetings. Initial speculation had centered on some type of sonic attack, owing to strange sounds heard by those affected. But an interim FBI report in January found no evidence that sound waves could have caused the damage.